Turkmens - - Oghuz remnants -- have been in south-western Central Asia for a long time. 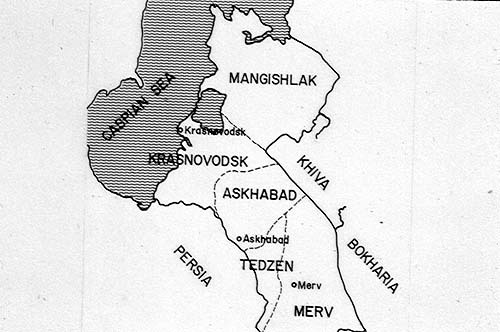 The Khivan power sphere has long contained a significant Turkmen population, whose homeland until the 16th c. was the Mangishlak 1 peninsula (In those days the area was remote and rainfall adequate for pastoral life.) from which they were displaced by Kalmuks in the 17th c.2 and scattered up along the Amu Daria into Bukhara, and Khiva, and to the southern rim of the steppes on the mountain fringe next to Persian power. A good Turkmen ethnographic article is that by William Wood in the exhibition catalogue, Vanishing Jewels.3 He knows the Soviet sources and some European travel accounts.4 These contain data concerning Turkmens (data which are typically organized by main wings, subsidiary clans, and sometimes, families) in Khiva have predominantly to do with Yomuds and Goken, the Chodor, so to speak, bit players. Particularly instructive is a review of Khiva immediately after the Russian conquest which mentions that the Aleli moved out of the Russian sphere south into the Akhal area, 600 kibitkas (a Russian term for domicile utilized for tax purposes), which would be on the order of 3000 individuals; 7,000 kibitkas of Jemshidi moved from Khiva khanate and settled between “Kupya-Urgench in Mankytom”. The Englishman Abbott in 1840 encountered numerous Yomuds (and Jemshidi) in the Murgab valley of south central Turkmen country.5 In sum, confederation locations were fluid, changing over time, and population estimates at all times and from all sources are never reconcilable. It is the case, then, that various compilations of peoples and places other than at the most general level are a slippery plank. In addition, little is secure which connects various groupings of carpet characteristics to particular times, peoples, and places. Khiva was an oasis town on the lower Amu Daria river (earlier, Oxus, a corruption of Turkic for White Water). 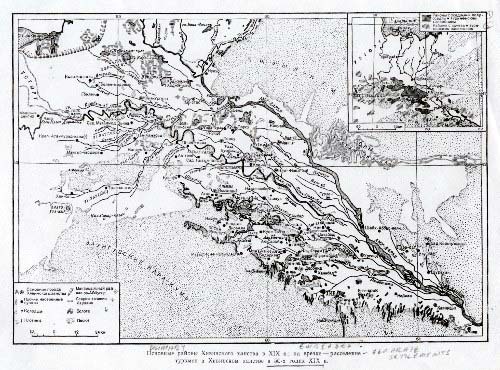 The sketch map (Russian text) shows the oasis in 1850; highlights are (a) the finger lake-appearing dark areas which identify dams and water impoundments for irrigation; (b) Khiva town’s location; (c) that of Tashauz (downstream from Khiva); and, (d) the inset map which shows Turkmen areas, the diagonal lines indicating sedentary groups, the lighter lines the nomadic, and the grids of dots, those on the steppes. From the capture of Urgench (the then capital) in 1379 Khwarizm (land of Khiva) Timurid rulers were in control until 1505 or thereabouts when the mean Uzbeg Shaybani Khan drove nice Baber, last of the Timurids, into northern India. 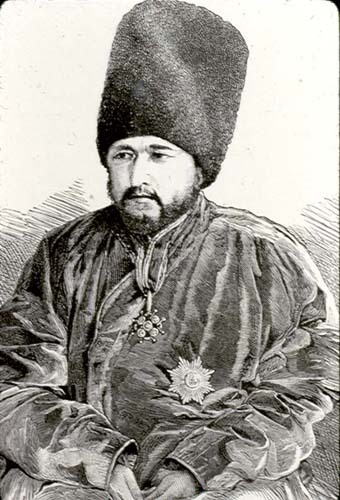 Successor Uzbeg groups ruled Khiva (Shaybanid, 1512 -- 1920) and Bukhara (Astrakhanids and Mangits, 1599 -- 1920) amid mutual conflict, ups and downs of power and territory, and buffeting by the outside: Kalmuks during the first half of the 17th century, Nadir Shah of Persia in the 1740’s, and (for Khiva) inconsequential Turkmen occupations in the first half of the 18th century.6 The Kalmuk incursions landed a large part of the Chodor confederation nearer to Khiva. Uzbeg khans celebrated their nomad ancestry. Jenkinson (c.1550) noted the Khivan royal presence ensconced in “a little round house” replete with felts and carpets and Muraviev’ not quite 300 years later sketched the Khiva khan’s yurt serving as the reception center within the palace compound. The Chodor were one of the 22 Oghuz groups. 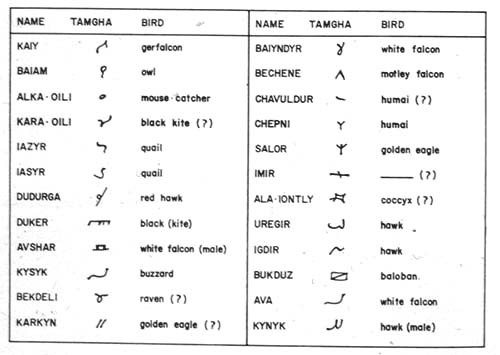 Tamgas, tribal crests of the confederations served as signs of ownership; these were known c. 1000;11 ongons, all birds, were confederation totems. Khanate archives have information describing Khiva’s multi-confederacy Turkmen population. 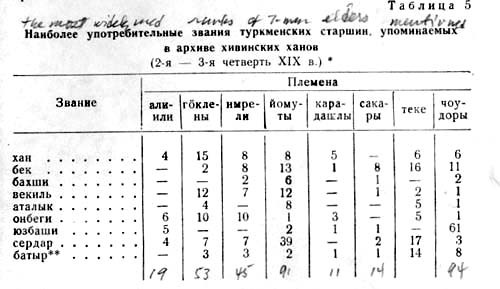 The table below (in Russian) summarizes the ranks in descending order of importance of leaders (left axis) and lists the many clans (horizontal axis) as of the 2nd and 3rd quarter of the 19th c.16 The comparatively high total of Chodor honorifics hints at but does not necessarily reflect a large population. History has drawn a veil around late 19th and early 20th c. carpet production in Khiva, in that the Empire allowed it nominal autonomy, thereby eliminating the standard Imperial provincial bureaucracy. No annual reports describe Khivan craft activities. Data from abutting provinces, however, provide a clue concerning its carpet-making. 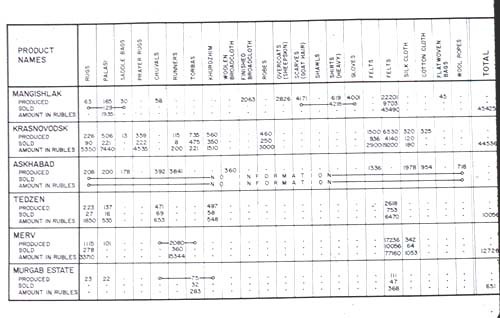 The chart below replicates a typical provincial report. 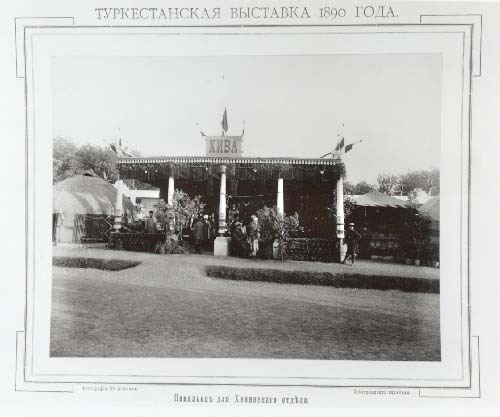 Khiva did, however, participate in the empire’s domestic craft promotion activities, one of its mechanisms being expositions; the photograph39 below is of the Khiva pavilion in Tashkent in 1890. Chodor bags form the valence along the front. Here is the gist of what these authors wrote touching upon Khiva and the Chodor. Dudin (191743 , 192644 ): The 1917 and the 1926 articles do not discuss Chodor carpets but the excellent 1917 summary survey did illustrate a bag face. 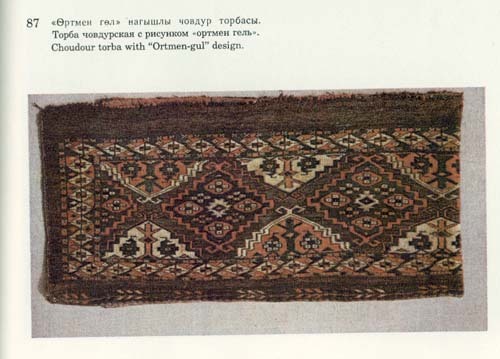 Moshkova, the best Soviet period source, noted in an earlier publication (1946)49 that Yomud influence caused the rugs of minor tribes to lose their original features but went on to say that Chodor and Goklen weaving nevertheless kept a distinctive quality distinguishing it from items conventionally called Yomud.50 The “distinctive quality” is not identified. An error of some consequence appears in an English version of this article employing the phrase “the original Chodor gol”; the Russian text reads “the main Chodor gol.”51 A big difference. Significant and overlooked is a 1963 tri-lingual text52 by Turkmen academics in which, while there is no text concerning Chodor carpets, some are illustrated. Most do not have the gol called ortmen. 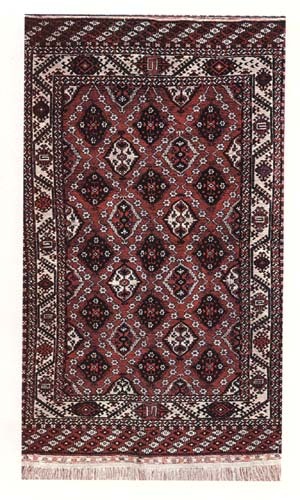 A rug woven in 1978 in Tashauz with the gol commonly called ortmen appears; its pattern, however, is termed shirbaz. This gol is the motif in all illustrations, but only once is the pattern so named. Tashauz, a Chodor town, and its rug production are cited in the old literature. The travel and the kustar’ literatures also shed light on carpets of the Khiva Chodor. The authors were interested in other things, but from time to time dropped a descriptive word. A useful survey of Chodor pile products is Munkacsy’s HALI article. He as examined many, and grouped bags into a useful compendium of characteristics: brown or brown-purple color, differences in field pattern accent colors, Persian knot open right, ribbed back, multi-colored chevrons in skirt, and, partly cotton weft alternating with wool or plied together. Why do Chodor rugs look the way they do? Timurid textiles involved a royal manufactory, the use of a large number of weaving techniques and materials along with frequent replication of architectural forms. 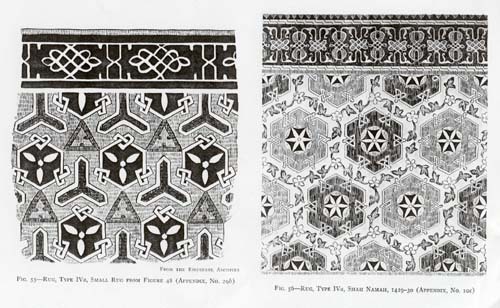 A Timurid/Turkmen pattern correspondence was noted long ago,67 but subsequently in rug writings blithely dismissed as “superficial.”68 But what is there to expect when country folk copy high style art other than a “superficial” resemblance? And, all-over repeat patterns were endemic to Western and Central Asian textile art. Part of the Sasanian (old Persian) repertoire; part of the Sogdian (pre-Turk) Central Asia. In brief, the design approach of a major category of Timurid textiles and of Turkmen carpets is the same: a grid of geometric motifs -- circles, octagons, hexagons -- interlaced with a second grid of smaller similar motifs. This grid also frequently contained in-filling decoration of endless knots, vines, vines with blossoms. So does the vine be-draped Tashauz rug. Similar iconography of course could have arisen from other sources or spontaneously due to the inherent nature of woven materials; adaptive copying isn’t the only possibility. In this regard, however, it is useful to remember that Turkmens always to some extent wove for a market which up until the last quarter of the 19th c. was quite local. An interesting convergence thus arises: Chodors in the small town and minor district Tashauz, the ortmen motif, and proximity to the seat of Khivan Uzbeg power. All of which is only circumstantial but nevertheless leads to a plausible speculation concerning what might be not only the principal but also the original Chodor gol. This set of circumstances also suggests that this gol – and by implication others in the Turkmen formulary -- may have been created de novo at the beginning of the modern period (1600). 1 Pinkerton’s Voyages, “Accounts of Independent Tartary”, Vol IX, p. 327 – 328. 2 Desmaisons, Petr. I., History of the Mongols and the Tatars, by Ebulgazi Baradin Khan, Khiva Khan, 1603 – 1664, from a manuscript in the Arabic museum, St. Petersburg, Philo Press reprint, Amsterdam, 1970, p. 337, p. 338. 3 Wood, William, Vanishing Jewels, Turkmen Ethnohistory, Rochester, 1990. p. 27 ff. 4 Sykes, Percy, Ten Thousand Miles in Persia, 1902, London, 1902, pp. 15 – 18; Yate, C. E., Khorasan and Sistan, Edinburg and London, 1900, p. 226. p. 280; Aucher-Eloy, Remi, ed. Jaubert, Paris, 1843, pp. 347 – 48; and others. 5 Abbott, James, Narrative of a Journey, (1840) 2nd ed., London, 1856, p. 21. 6 Grousset, Rene, trans. Naomi Walford, The Empire of the Steppes, a History of Central Asia, Rutgers University, New Brunswick, 1970, p. 421, p.486– 87, p.521. 7 Riza Quoly Khan, Relation de l’Ambassade au Kharezm, trans. Chas. Schefer, Philo Press reprint, Amsterdam, 1975, p. 78, p. 89. 9 Desmaisons, Petr. I., Histoire des Mongols et des Tatars par Aboul-Ghazi Bahadour Khan, Philo Press, Amsterdam, 1970, pp. 220 –350, variously. 10 Markov, G. E., Ocherk istorii formirovaniia severnykh Turkmen, Moscow, 1961, pp. 6 – 13; 46 –55; 60 – 63; 76 – 81; 194 – 197. 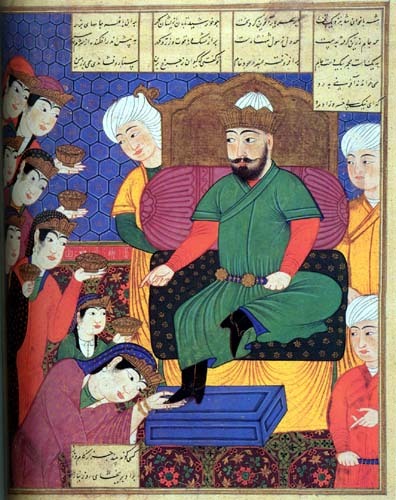 11 Mahmud al-Kashgari, ed. 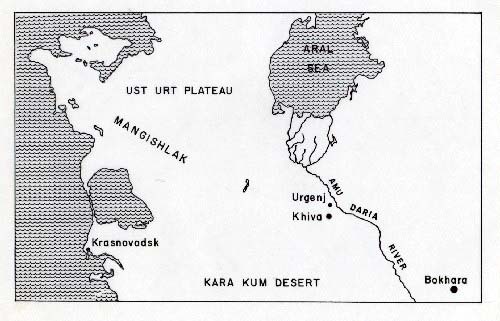 Dankoff and Kelly, “Compendium of the Turkic Dialects”, Sources of Oriental Languages and Literatures, 7, Turkish Sources, Part I, Harvard, 1982, pp. 40-41. 12 Mir Abdul Kerim Boukhary, Histoire de l’Asie Centrale, 1740 – 1818, trans., Chas. Schefer, Paris, 1876, p. 171, p. 184 – 185, p. 194. 13 Abbott, James, op. cit., p. 176, Vol. II p. 312; Weil, Capt., La Tourkomenie et les Tourkmenes, Paris, 1880, trans. of article in Voienny Sbornik, sept/oct, 1879, p. 40..
14 Morier, Capt., trans. Carl Zimmerman, Memoire, London, 1840, p. 48. 15 Muraviev’, N. N., Voyage en Turkomanie et Khiva, trans. J. B. Eyries and J. Klaproth, Paris, 1923, p. 105, p. 233, p. 261. 16 Bregel’, U., Khorezmskie Turkmeny v XIX veke, Moscow, 1961, p. 125. 17 Abbott, James, op. cit., Appendix. 18 Burnes, Alexander, Travels into Bokhara, London, 1834, Vol, II, p. 382. 19 Conolly, Athur, Journey to the North of India, London, 1834, p. 37. 20 Pogorel’skii, I. V., Ocherki ekonomicheskoi i politichektoi istorii Khivinskogo Khanstva, 1873 – 1917 gg., Leningrad, 1965, p. 33/34. 21 Mir Abdul Kerim Bukary, op. cit., p. 164. 22 Sbornik geografich, topograficheskikh’i statisticheskikh’ materialov’ po Azii, Statischeskiya dannyya o Zakaspiiskoi oblast’, Vol. 29, 1888. 23 Barthold, W., Turkestan Down to the Mongol Invasion, Oxford Univ. Press, London, 1928, p. 235. 24 Nouvelle Description de la Kharizme ou Khwarezmie, Annales des Voyages, Vol. 4, Paris, 1809, p. 382. 25 Conolly, Arthur, op. cit., p. 165; Abbott, James, op. cit., pp. 327-28; Aucher-Eloy, Remi, Relation de Voyages en Orient (de 1830 a 1838), p. 354 ff. 26 Capus, Guillaume, A Travers le Royaume de Tamerlan, Paris, 1892, p. 381. 27 Khanikof, Nikoai V., trans. de Bode, Bokhara, London, 1845, p. 224. 28 Podgorelsky, op. cit., p. 26. 29 Annales des Voyages, ed/pub Malte-Brun, Vol 4, 1809, p. 381—82. 30 DeLevchine, Alexis, Description…des Kirghiz-Kazaks, trans. from Russian, Ferry de Pigny, Paris, 1840, p. 450. 31 Nashi soisedi v Srednei Azii, “Khiva i Turkmeniya”, St. Petersburg, 1873, p. 34. 32 Bregel’, U. E., Khorezmskie turkmeny v XIX beke, Moscow, 1961, p. 66. 34 Muraviev’, N.N., op. cit., p. 7, p. 29, p. 59, p. 98. 35 Ibid., p. 89, 90, 98. English and the French translations contain key words which are inaccurately rendered. The French text is pretty much OK; the English (apparently based on a German translation) has been considerably diddled with both in words and organization and is not reliable. 37 Obzor Zakaspiiski krai na godu 1893, pp. 91/92. 38 Sbornik geografich, topograficheskikh’ i statisticheskikh’ materialov’ po Azii, op. cit., vol. 29. 40 Pierce, Richard A., Russian Central Asia, 1867-- 1917, Cambridge University Press, London, 1960, p. 334, note 64. 41 Semenov, A., “Kovry Russkago Turkestana”, Etnograficheskoe obozrenie, No, 1 – 2, Review of the Bogoliubov book, Moscow, 1911, p. 144. 42 Felkersham, Baron, Staryie gody, Starinnye kovri Srednei Azii. October – Decermber, 1914, p. 109. 43 Dudin, S. M., Kovry Srednei Azii. Stolitsa i Usad’ba, No. 77-78, 30 Marta, 1917 g., p. 13. 44 Dudin, S. M., Sbornik muzeya antropologii i etnografii, kovrovy izdeliya Srednei Azii, Vol. VII, Moscow, 1928. 45 Moshkova, V. G., Carpets of the People of Central Asia, ed., trans., George W. O’Bannon and Ovadan K. Amanova-Olsen, 1996. 46 Saurova, G., Sovremennyi turkmenskii kover i ego traditsii, Ashkhabad, 1968. 47 Gogel, F. V., Kovry, Moscow, 1950. 48 Tsareva, Elena, Rugs and Carpets from Central Asia, Leningrad, 1984. 49 Moshkova, V. G., Kovry narodov Srednei Azii, Materialy ekspeditsii 19 – 1945 godu, Tashkent, 1970. 50 Moshkova, V. G. Carpets of Central Asia, op. cit.,p. 119, p. 177. 51 Moshkova, V. G., Sovetskaya Etnografiya, Plemennye ‘goli’ v Turkmenskikh kovrax, Moscow, 1946, p. 148. 52 Gylyzhov, A. and Klychev, A. M., Carpets and Carpet Products of Turkmenistan, Ashkabad, 1963, pp. 115 – 117. .
53 Capus, Guillaume, A Travers le Royaume de Tamerlan, Paris, 1892, p. 381. 54 Obzor zakaspiiskoy oblasti za 1900 gode, pp. 100 – 117. 55 Tumanovich, O., Materialu k izucheniu istorii i etnografii, Turkmenistan i Turkmeny, Askhabad, 1926, p. 67. 56 Podgorelski, op. cit., p. 26. 57 Tumanovich, op cit, p. 66. 58 Ivanov, P. P., Vukhiv khivinskikh khanov XIV v., Leningrad, 1940, p. 155. 59 Frye, Richard W., Bukhara, The Medieval Achievement, 1965, p. 31. 60 Olufsen, O., The Emir of Bokhara and his Country, London, 1911, pp. 230 -- 31. 61 Manz, F., ed., Central Asia in Historical Petrspective, Boulder, 1994, p. 40. 62 Allworth, Edward. A., The Modern Uzbegs, Stanford, 1990, p. 61. 63 Bouvat, Lucien, “Essai sur la Civilization Timouride”, Journal Asiatic, Apil-Juin 1926, p. 253, p. 258. .
64 Lentz, Thomas, and Lowry, Glenn, Timur and the Princely Vision, Washington, 1989, pp. 216—18. 65 Travels and Adventures of the Turkish Admiral, (1553-1556). trans. A. Vambery, London, 1899, p. 72. 66 Edward Allworth, Columbia University, in conversation. 67 Briggs, Amy, “Timurid Carpets”, Ars Islamica, Ann Arbor, 1940, p. Fig. 56, Fig. 44, p. 29. 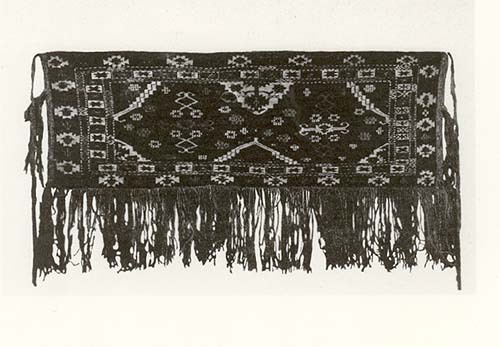 68 Thompson, Jon, “Turkmen Carpet Weavings”, Turkmen, 1980, p. 60.